Here’s the thing about me and writing: people seem to think that it’s easy, that it just flows out naturally when a lot of times, it’s not. Yes, there are moments when you get that moment of inspiration and you can write on and on and it will just keep going but for the most part, if it’s not part of your creative process or if you are not moved to do so, you don’t. You’re stumped. You have writer’s block and there isn’t anything you can do about it. That has been my problem for the past few weeks. I’ve been wanting to blog, and I’ve been meaning to, but the words just would not come out. When I write about things that I am interested in, it can be easy to write. Will it be good? Maybe, maybe not…but it will not be a struggle (OK, maybe a little). But if I’m writing for work, if it’s about something technical or for business, I can get stumped. Maybe because it’s not really something I enjoy doing (even if I have to), maybe it’s because there is too much pressure placed on me by people who expect that I can do a quick and easy job of these things. 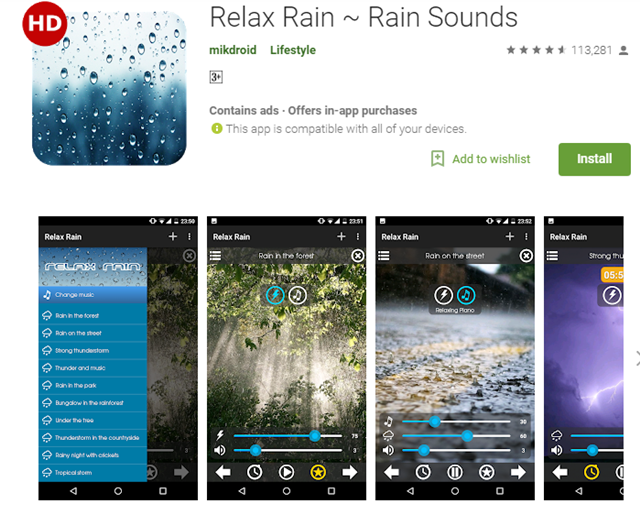 Relax Rain – It has ads, but it doesn’t interrupt the listening experience unless you are changing sounds while you listen. You can pay P50.00 for the premium version that starts the app with your chosen sound and a sound menu list. Otherwise, you can keep it free and let it randomly select sounds once you open the app. You then have options to play a relaxing piano sound along with lightning sounds to each rain sound selection you can pick via arrows at the bottom of the screen. Each sound – the rain, lightning and piano – has different volume controls so you can have the right combination of sounds you prefer. Among the sound setups you can use are (all self-explanatory, really): Under the Tree, Thunderstorm in the Countryside, Rainy Night with Crickets, Tropical Storm, Rain in the Backyard, Thunderstorm, Rain on The Tin Roof, Under the Umbrella, Puddles in the Country, Rain on Window, Hailstorm, Rain in the Gutter, Distant Storm, Light Rain at Night, Lodge in the Rainforest, Light Rain on the Windshield, Rain on Leaves, Light Rain in the Backyard, , Heavy Rain on the Windshield, Tent in the Rain, Dripping Water, Tent in the Thunderstorm, Wind and Rain, Inside the Car, Rain in the City, Inside the Motor Home, Rain on the Car Roof, Inside the Farmhouse, Morning Rain, Rain on the Skylight, Rain in the Forest, Rain on the Street, Strong Thunderstorm, Thunder and Music, Rain in the Park and Bungalow in the Rainforest. You can also select a time for the sounds, so that it will stay on for as long as you want as you don’t remove it from your screen display. 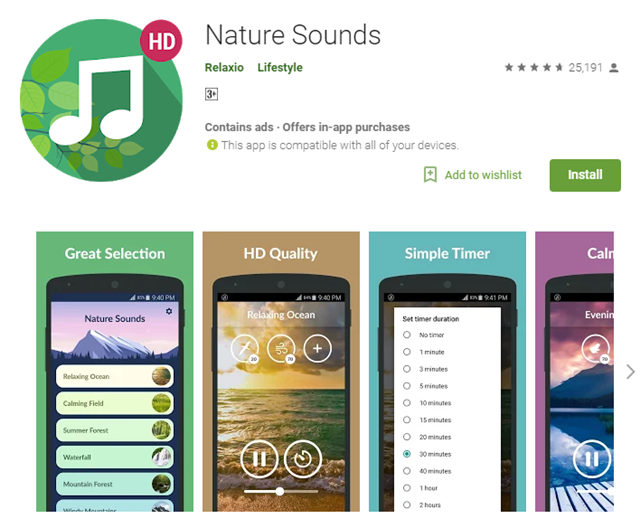 Nature Sounds – With this app you have the following sound options: Relaxing Ocean, Calming Field, Summer Forest, Waterfall, Mountain Forest, Windy Mountains. Evening Lake, Rain on Grass, Perfect Rain, Rain on Window, Thunderstorm, Calm Night, Warm Camp Fire. The app allows you to modify the amount of sounds for each theme. You can select music (piano, flute, chimes, cymbals), nature (fire, wind, stream, rain on leaves, rain, thunder, lightning), animals (birds, frogs, wolf). You can also set a timer for up to 8 hours to play the app. It’s a free app so be prepared for ads at the bottom of the screen. Unfortunately, you can’t use the app if you plan to use other apps on your phone or tablet because the sounds stop once you remove it from your screen. If you want it premium you would have to pay P43.00. 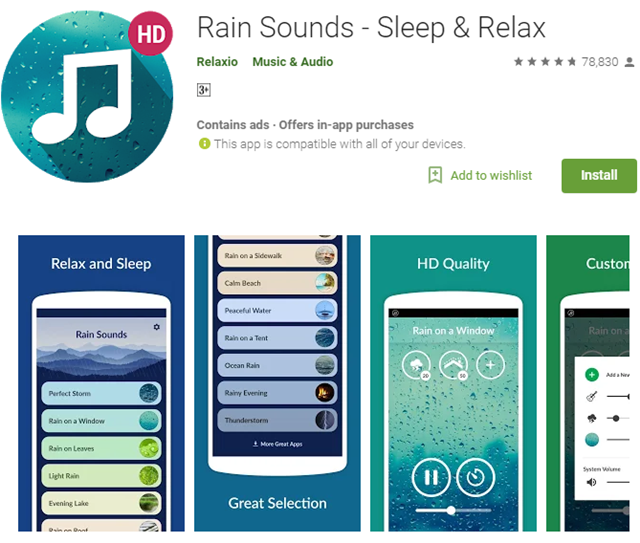 Rain Sounds – This app is probably from the same company that made nature sounds because the setup is the same. The only difference is with the selections of sounds: Perfect Storm, Rain on Window, Rain on Leaves, Light Rain, Evening Lake, Rain on Roof, Rain on Sidewalk, Calm Beach, Peaceful Water, Rain on Tent, Ocean Rain, Rainy Evening and Thunderstorm. There are more options for music and nature sounds with this app, but it also has limited animal sound options. The premium version of this app costs P49.99. Just Rain - My little nephew loves this app. It is exactly what it is called: just rain. 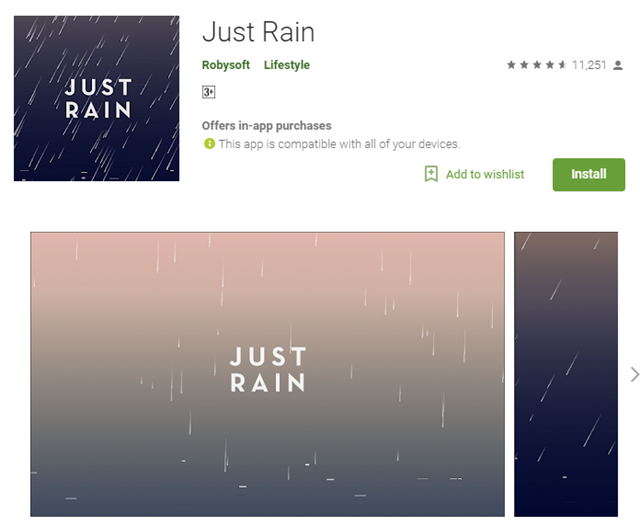 You open the app and your screen has a visual of rainfall, which you can adjust to make it harder or softer and can be directed from left to right depending on your preference. My nephew loves playing with the app and adjusting the settings until he finds the right type of rain he wants to see. It can feel a little calming just to look at it when it is a little on the soft side. There are additional features for this app that you can buy for P52.00 but I think I like it just the way it is. 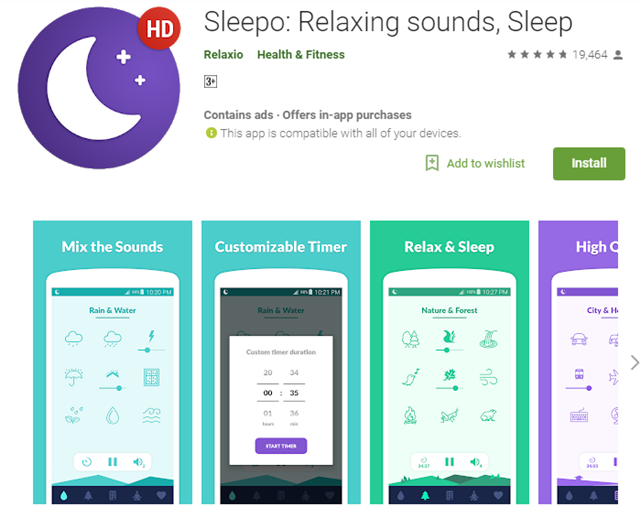 Sleepo – The app has a selection of themes you can choose from (Rain and Water, Nature and Forest, City and Household, Relax and Meditation), along with variables you can adjust to create the right combination of sound you prefer. Unlike most of the other sound apps, this will continue to play even if you remove it from your main display. It is also the most expensive to get as a premium app at P110.00. 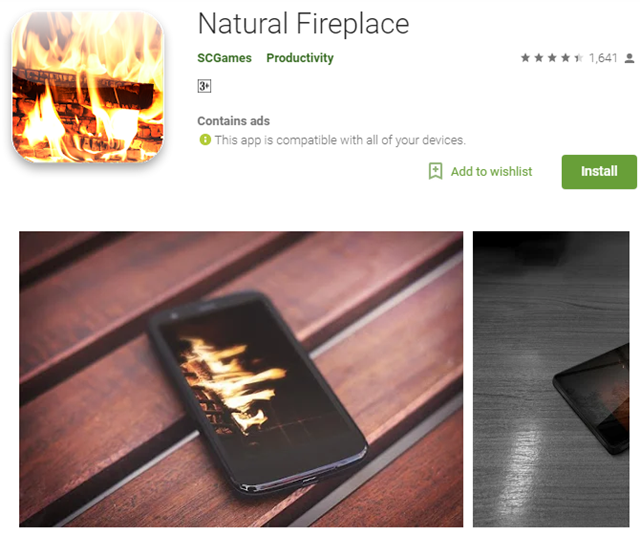 Natural Fireplace – As the name of the app implies, it shows a natural fireplace effect on the screen of your phone or tablet and has the sound of a slow fire burning along with it. It has a built-in timer, but it has no other controls. Even if you close the app once you’ve opened it, the sound for the fireplace is still there, which makes the app a little difficult to close. I think we all have our different ways of unwinding and relaxing and sometimes we try various things to see what works. These sound apps help me sometimes, but I can’t say that it is 100% effective all the time. Sometimes I put on a playlist from Spotify and that helps too. There are also other times when complete silence does the trick. It’s really up to you and what mood you’re in along with what you need to do. If any of these apps sound appealing, let me know if you give them a try – or if you’ve found something else that might be better, do share!